This undated combination picture released from North Korea's official Korean Central News Agency (KCNA) on September 16, 2017 shows a launching drill of the medium-and-long range strategic ballistic rocket Hwasong-12 at an undisclosed location. North Korea said Saturday it was seeking military “equilibrium” with the United States as leader Kim Jong-Un vowed to complete Pyongyang’s nuclear programme. North Korea successfully fired a Hwasong-12 intermediate-range ballistic missile over Japan on Friday, responding to a new round of UN sanctions over its sixth nuclear test with its furthest-ever missile flight. “Our final goal is to establish the equilibrium of real force with the US and make the US rulers dare not talk about military option for the DPRK,” Kim said, according to the official Korean Central News Agency. Kim said the country was close to the goal of completing its nuclear ambitions and should use all power at its disposal to finish the task, saying it had “nearly reached the terminal”, KCNA reported. The young leader said Friday’s launch had increased the North’s “combat power of the nuclear force”. “We should clearly show the big power chauvinists how our state attain the goal of completing its nuclear force despite their limitless sanctions and blockade,” Kim said, according to KCNA. The UN Security Council condemned the launch as “highly provocative”. The US has called a council meeting of foreign ministers Thursday focusing on the threat from North Korea, diplomats said. President Donald Trump has also scheduled talks with the leaders of Japan and South Korea to address the crisis. The US Pacific Command confirmed Friday’s rocket was an intermediate range ballistic missile (IRBM) and said the launch did not pose a threat to North America or to the US Pacific territory of Guam, which Pyongyang has threatened with “enveloping fire”. Seoul’s defence ministry said it probably travelled around 3,700 kilometres (2,300 miles) and reached a maximum altitude of 770 kilometres. Video broadcast by the North’s Korean Central TV showed a missile blasting off from a mobile transport vehicle and shots of it soaring through clouds. “The combat reliability of Hwasong-12 was thoroughly verified,” Kim was quoted as saying by star TV presenter Ri Chun-Hee, who appears when North Korea wants to boast of its achievements or needs to make an important announcement. North Korea’s official party newspaper Rodong Sinmun allocated half its coverage to pictures of the launch. Yang Uk, an analyst with the Korea Defence and Security Forum, told AFP that Kim’s stated ambition of achieving a military balance with Washington was some way off. “It’s too unrealistic for North Korea to reach equilibrium in nuclear force with the US,” he said. The North has raised global tensions with its rapid progress in weapons technology under Kim, who is regularly pictured by state media overseeing launches and visiting facilities. 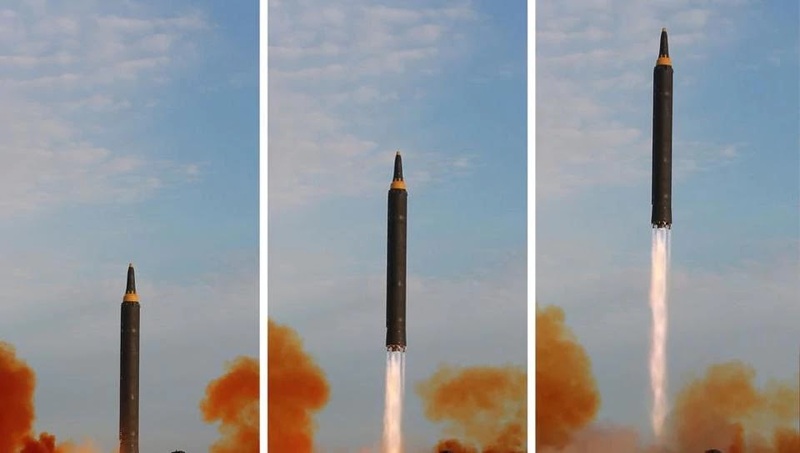 “The latest launch, which was apparently made from a TEL (transporter erector launcher or missile vehicle) instead of a makeshift launch pad, means the North is now ready to deploy the IRBM Hwasong-12 for combat purposes,” Yang said. “The North appears to have resolved technical difficulties in launching the missiles from TELs. With its mobility being increased, Hwasong-12 poses an imminent threat to the US and its allies in the region,” he said. The North’s previous missile launch, a Hwasong-12 IRBM just over two weeks ago, also overflew Japan’s main islands and was the first to do so for years. “Within three to five years, the North is expected to be capable of operating nuclear missiles as deterrence,” Yang added. Russian President Vladimir Putin and his French counterpart Emmanuel Macron jointly appealed for talks with North Korea, saying this was the only way to resolve tensions over its nuclear programme. The appeal was directed at the United States and Japan, which have called for pressure to be ramped up through sanctions rather than pinning hopes on talks. Russia and China, North Korea’s main ally, on Monday backed a US-drafted resolution at the Security Council to impose fresh sanctions on Pyongyang -- but they maintain dialogue is key to defuse the crisis. The sanctions imposed on Monday banned the North’s textile trade, stopped new work permits for its labourers, and imposed restrictions on shipments of oil products, among other measures. In response to Friday’s launch, South Korea’s military immediately carried out a ballistic missile drill of its own, with the defence ministry saying it took place while the North’s rocket was still airborne. President Moon Jae-In told an emergency meeting of Seoul’s national security council that dialogue with the North was “impossible in a situation like this”. But unless something changes, it is likely the tests will continue, said professor Yang Moo-Jin of the University of North Korean Studies. “There is a high possibility that the North may test-fire another ICBM by the end of this year to prove it has mastered the technology,” he said. North Korea said Saturday it was seeking military “equilibrium” with the United States as leader Kim Jong-Un vowed to complete Pyongyang’s nuclear programme. North Korea successfully fired a Hwasong-12 intermediate-range ballistic missile over Japan on Friday, responding to a new round of UN sanctions over its sixth nuclear test with its furthest-ever missile flight.